Unfortunately, the answer is yes. Winters in the Willamette Valley are not harsh enough to completely kill off fleas and they never have been. With the warmer winters we have been experiencing lately, fleas seem to be even more prevalent through out the winter. To make matters worse, the flea products that used to work so well are no longer effective. We often find fleas on a dog or cat when their caretaker is unaware that the pet has fleas. An itchy animal does not always mean fleas, but is the first thing to rule out. With some pets even one flea can cause a reaction. All pet people should have a flea comb, with the exception of those with extremely thick coats that the comb will not go through. This is a great tool for checking for fleas. Many times it takes quite a thorough combing to find a flea, but if you find many initially, you know you have a big problem! 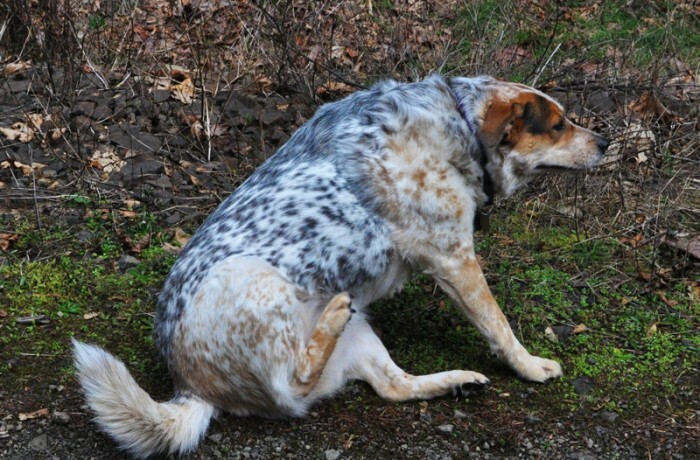 Dogs that are biting at the base of the tail area are often those with a flea problem. If you see small black dots, it could be flea dirt (excrement). If you get this dirt wet and it turns rusty red that is an affirmative for fleas. Really take a close look at your pet as sometimes the pests are difficult to detect. If we suspect fleas, we will do a thorough inspection and give the pet a soak in a natural flea killing shampoo. If the animal has more than just a flea or two, then some steps may be necessary to take at home. We carry a product that is great for those with carpets which can harbor fleas. Sometimes it may be necessary to treat your yard as well. We always like to start with natural products, but with infestations, you may need to talk to your vet about the best product to take care of the problem. There is no easy answer, but getting your pet groomed regularly as well as keeping up on washing and vacuuming, should help keep the bugs to a minimum.